You’ve been hearing about all the wonderful new Facebook features, and like us, you’re probably super-eager to get started with them. 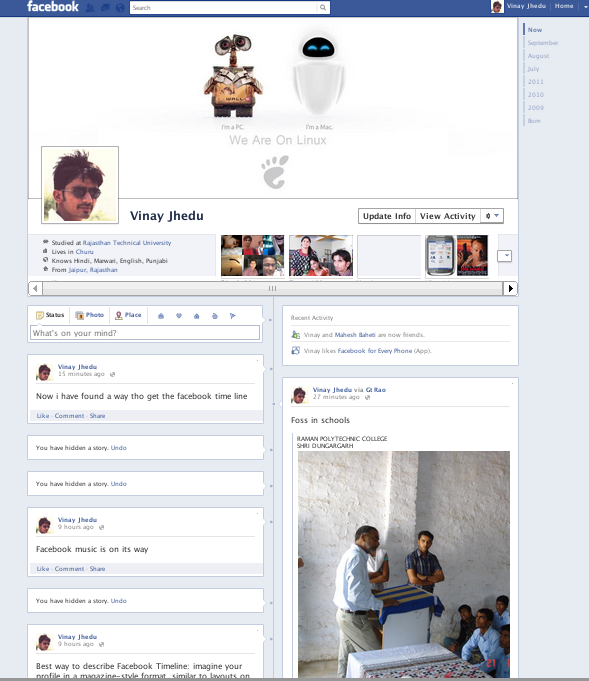 If you’re willing to go through a series of eight steps, you can get into the brand-new Facebook Timeline right now. First, you’ll need to go to the Facebook developer page, which is a part of your Facebook account. Make sure you’re logged into your Facebook account, and then simply follow this link to get started. 4. After you’ve verified yourself as a human, you’ll reach this screen, where you’ll need to click “Open Graph” on the left side. 5. You’ll see the next screen, entitled “Get Started with Open Graph” — fill in anything you want (it doesn’t matter) in those fields under the heading “start by defining one action than one object for your app.” Click Get Started. 6. On this screen, do nothing except scroll to the bottom and click “Save Changes and Next.” Do the same thing on the next screen. 7. You’ll be taken to this screen. Wait a few minutes, and then go to your Facebook homepage. That’s where you’ll be invited to enable Timeline. Be patient at this point — sometimes it requires you to wait before the changes take effect. When you go back to your Facebook homepage, you’ll see this. Success! Click Get It Now, and you’re in!